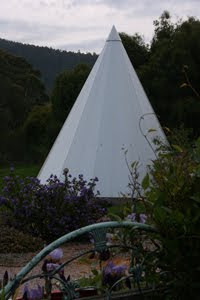 Hi all of my online friend s - I am now back home after a wonderful weekend in beautiful Tasmania. Susan and I had the most wonderful time just "being ourselves". We arrived in Launceston around 6.00pm Friday and headed to "Me Wah Restaurant" for the best Chinese meal you could wish for. Last year this restaurant won the award for "Australia's Best Asian Restaurant". 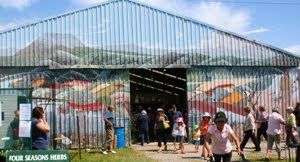 Our Saturday was filled with the exhilaration of the "Tasmania Craft Fair" in Deloraine. This fair is an annual event and attracts thousands and thousands of people to several locations over a 4 day period, selling all number of things. Saturday night came and it was time for another delicious meal at the "Lucas Hotel" in the small township of "Latrobe". 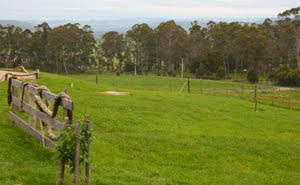 We stayed overnight at "Sherwood B&B" which is situated on 40 acres of the most amazing peaceful countryside in Tassie. We awoke Sunday to another beautiful sunny day and headed o ver to the "Quiet Cone" for our "Gong Meditation Session". Our hour in the Quite Cone was - what is the right word to explain - amazing, enlightening, just great. After an afte rnoon of driving through the beautiful bright green Tassie landscape we were at the airport to board a plane to head back to Melbourne. That's when we struck our one little blimp - our flight was delayed 1 1/2 hours - oh well, we just decided to add it to our little adventure. After such a weekend I feel so relaxed, revitalised and just happy to have someone like my cousin Susan in my life. I took quite a few photos, so I will just have to share them with you over a few days. That Quiet Cone looks interesting. I have never seen anything like that before! What a fabulous get away - such fun to travel and experience such interesting places! Boy I could use that from time to time! Hope you are back refreshed - love that quiet cone too! Please you had a great weekend. Look forward to seeing your other photo's aswell. To put together collages, download free software called Picasa 3 - excellent for making the most of your photo's. Your weekend and your photos... both heavenly! The peace and Joy you experienced just exude from you post, Davine. I think there will be a few folks wanting to try it for themselves - me included!